After graduating from Oregon Health Sciences in Portland Oregon, I have been fortunate to practice dentistry in the Spokane area for the past 11 years. 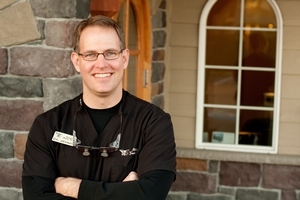 Millwood Family Dental opened it's doors in the Spokane Valley in 2003 and I have enjoyed the past eight years building a practice with a team that is exceptional and loves what they do. My goal as a dentist is to provide our patients with the same level of care I want my family to have - using the best materials and technology available to give our patients what they deserve - high quality care. My team is experienced working together and we believe that skill and compassion go hand in hand when providing exceptional patient care. As a dental professional, I stay up to date on the latest advancements in dentistry in order to provide the most current treatment options for my patients. As a doctor, I recognize that my patients are unique individuals who have placed a great deal of trust in me and my team. When I am not practicing dentistry, I enjoy spending time with my wife and our five children. We love living in the Inland Northwest and taking advantage of outdoor activities all year long.